[tweetmeme]I love the game “Angry Birds.” I am not a gamer, and not often enticed into playing games, but I have become addicted to the mobile game Angry Birds. The largest mobile app success story, the objective of Angry Birds is for the player to take control of a flock of birds that are attempting to retrieve eggs that have been stolen by a group of evil green pigs. Angry Birds is the top paid app in Apple’s iTunes, with more than 100 million downloads. The game’s popularity has spurred its creators to expand the mobile app game to gaming consoles, personal computers, and now even a blockbuster animated movie! Thus, I was excited to read the excellent article “10 things that CIOs can learn from Angry Birds” by Daniel W. Rasmus of the Australian MacWorld. While the article focuses on lessons the Angry Birds game can provide Chief Information Officers, I think those same lessons are applicable to home business entrepreneurs as well. The only way to understand the nuances of the Angry Birds game is to play and learn the techniques and strategies to successfully complete the levels. The same is true in business! While it is always a good idea to learn as much as you can about the business you want to start, nothing can truly prepare you for starting and running a business than by actually doing. Only by actually jumpstarting the business will you know what the business truly entails and whether it is something that you want and can successfully do. By starting the business, you learn to become an entrepreneur, and understand the risks you face and the opportunities available to you. In Angry Birds, each bird has its own unique ability. The white bird drops a powerful egg. The black bird acts as a bomb. The yellow bird can go the longest distance and most useful in breaking through wood. The blue bird can break into three similar birds when the screen is touched and does the best job in breaking ice. If you are a freelancer or solo home-based entrepreneur, it is important to recognize that you don’t have to do everything yourself. Focus on what you do best, and get help however you can with other tasks. Help can come from technology, outsourced manpower (if you have the resources), other family members who can pitch in to help you, and outside advisers or mentors. As you grow your business and you start employing people, be prepared for the shift in your role from being the founder/visionary for the business to that of a manager. Resist the urge to continue doing everything, and start delegating tasks to your team. Avoid micromanaging every aspect of their jobs, and give them free rein to grow and learn. When playing Angry Birds, you oftentimes know immediately if the game will end well- or not. You can tell as soon as the bird gets off the launcher if you can get a high score or not. If your start does not look promising, you simply restart the game. In life and in business, sometimes things are just never going to work out, and it is important to recognize that. This is true with regards to the whole business in general, or when introducing a new product or service, or even in your choice of hiring an employee. As much as you want things to work out as you want it, sometimes fate is just not cooperating and everything is not going your way. The key is having the foresight and courage to recognize a good deal from bad, and cut your losses as soon as possible and move on. Don’t get caught up with the “maybe-it-will-work” and continue to sink in resources, time and energy into something that has no chance of ever working out. Like Angry Birds, you can just start from scratch. The Angry Birds game uses different types of birds necessary for cracking various types of materials and surfaces used in the game. There’s wood, concrete slabs, glass, even fruits and clouds. The key to winning the game is to know what bird to use, and how to use it given the obstructions shielding and protecting the green pigs. As a solo entrepreneur with limited resources, your biggest challenge is to do every aspect of the business by yourself. You have no choice but to do all the tasks — from marketing, product development, secretarial tasks, bookkeeping, even cleaning up your office — by yourself. However, it is important to prioritize the tasks that are necessary for taking the business to the next level. Also know the tasks that are the best use of your time. Don’t get caught up in tasks that do not bring you a step closer to your objectives. When your business grows and you are now in a position to get outside help, take advantage of it. Focus on the aspect of the business that you do well. If your forte is relationship building, focus on getting in touch and networking with potential investors, partners or even advisers. Outsource the things that you either do not have the time nor the expertise to do on your own. One of powerful birds in the game is the black bird. It can break concrete surfaces, and once it lands, the black bird explodes. As you play the game, however, you’ll find that even the bomb will not destroy your target if it lands in an area where its explosion is contained. There are many instances in business where the results may underwhelm your expectations. Think of social media: you may hear of the tremendous success other businesses get from doing Facebook or Twitter. Yet as soon as you do social media for your business, you find that you can barely get any fans or followers. You find that it is not as easy as you think. Or you may have what you think is a winning product. But you can barely get distributors interested in carrying it, and your target market is not flocking to buy it as you expected. To succeed in business, various elements need to come together, not just having an “explosive” product. Improving your score in Angry Birds is not easy. Sometimes you try the level again to improve the one star you got, only to find that you can’t even win that level anymore. To improve your score, you need to be patient, improve on the strategies that you have used in the past, or altogether try out different approaches. The improvement can be quick, but more often than not, just incremental. Patience is a key in business. While it will be good to find the winning formula and hit the jackpot as soon as the business is launched, most of the time growth happens slowly. You will need to find the right strategy that will work for the business. Some of your growth will be spurred by shaking things up in the business and making drastic changes. Realistically, though, growth happens with little improvements that you can do here and there. This is especially true if you have limited resources and manpower that constrains the amount of changes that you are able to do. Angry Birds consist of various levels using different types of birds, different configuration, and varying materials. Each game requires its own strategy. Business is full of challenges, from unfavorable economic situations, difficult customers, irrational suppliers, or loss of web traffic. It is important to be constantly on your toes, and prepared to meet these various challenges up ahead. If you’re a solo entrepreneur wearing many hats, being good in marketing doesn’t mean that you are good in financial management. Or you may be good when selling person-to-person, but you may need help in sharpening your online presence and selling online. Just because you were able to straighten the problem with your supplier doesn’t mean that you know how to deal with a penalty from Google resulting in 80% drop in your website’s traffic. The key is to recognize your personal strengths and weaknesses, and be willing to delegate or outsource tasks where your knowledge is weaker and you don’t have the time or resources to learn and experiment. 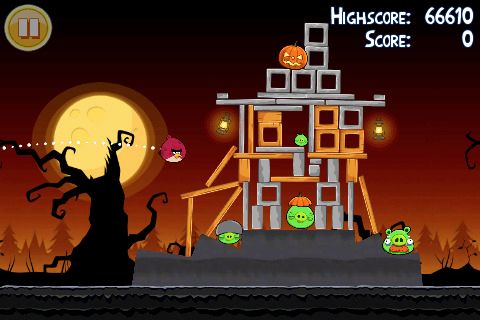 The fun part with Angry Birds is that it is hard to replicate the results of the same game you played before. There are many variables that come into play — e.g. the launcher tension, aim, and timing of all the elements — that every game is different. As a business owner, you will be always be faced with challenges. While some of these problems may seem similar at first, the nuances and context of the problem may be different. Even the process of dealing with problematic customers may vary from one person to the next. You can bring in past strategies and elements that worked in dealing with these problems, but it is important to always look at them with a fresh eye as there may be elements that require a fresh approach. Plus, your environment is constantly changing. If you’re a web business for example relying on the search engines to bring traffic to your website, the strategies that worked in the past may be enough to get you kicked out of the search engine results today. You need to be constantly abreast of the developments in your industry.. In some levels in Angry Birds, you can win by using only one bird. In other levels, however, you will need all the birds at your disposal to win. Just like in business, there will be challenges that you can win very easily. However, there may be instances where you have to dig deep within yourself and use every resources and arsenal that you have to solve the problem. You may need to sit down, analyze the complexity of the problem at hand, and line up possible advisers and consultants that can help you address the problem. You may need to use all the birds that you have to win over the situation. One of the beauty of the Angry Birds game is that it allows you more than one way to win the game. You can hit the top first, or go after the bottom — and still win. The key is to experiment different positions, different angles and different approaches to get the maximum score. Angry Birds is all about trying different approaches to win. What a connection the game Angry birds and catering to ones business. i like the article, very different from the normal ones.